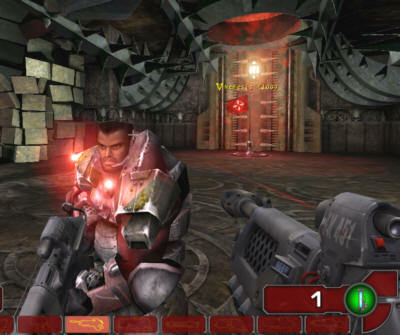 Unreal Tournament 2003 demo is finally out, and available for a free download. You can get it at just about any file download site, as well as at places like NVidia.com (link). Be prepared to download 100MB of data. One nice little addition to UT2003 demo is that it has a built-in benchmark utility. You can find the benchmark in the system subdirectory for the game after it installs. The file is appropriately named 'benchmark.exe'. Run this file, select the resolution you want to benchmark, and it will go through 4 different demos, 2 are "flyby" and 2 are "botmatch" demos. The flyby demos give you an idea of how high frame rates would be without bots, while the botmatch demos give you an idea of what kind of fps you can expect while actually playing the game. The good thing about this little utility is it lets people try the game with their video cards and systems to determine if the hardware will be able to play the full game with high detail and resolution settings. I decided to test out two systems here to see what they would do with the demo. The first system was an Athlon XP 2000+ with a GeForce4 4400 card and 512MB of PC2100 DDR DRAM. The other system was a T-bird Athlon at 1.4GHz with a GeForce3 Ti200 card and 256MB of PC2100 DDR DRAM. Both systems were running Windows 98SE, Direct X 8.1, and the 29.42 reference drivers from NVidia. In general, Unreal Tournament is not a particularly good benchmark in and of itself. This is because there are so many background activities, including complex bot artificial intelligence, that most systems give fairly low scores relative to other first person shooters. The new demo is no different. As you can see by looking at the two graphs below, frame rates are quite low compared with games like Quake III Team Arena. The top graph is for the "flyby" demos without any bots, and are not indicative of the frame rates you could expect in the actual game. The bottom graph is for the "botmatch" demos, and should represent the average frame rates you would get while playing the game. Average means that there will be substantially higher frame rates at some times, and substantially lower frame rates when many bots are on screen and firing weapons. Even with an Athlon XP 2000+ (1.66GHz) and a GeForce4 Ti4400 card, the average fps in the botmatch demos never exceeded 50fps, which is very low for an average. The interesting thing was that even at a resolution of 1600x1200, the fps didn't drop below 40fps. Also notice that with the GeForce3 Ti200, the frame rate never exceeded 41fps at any resolution. Now that you've seen the results, your next question might be, "but how is the gameplay on these systems?" The answer is, I could turn on all detail settings with the GeForce4 4400 system, and still have acceptable frame rates in the game at 1024x768x32bit color. With the GeForce3 Ti200 system, I had to turn one or two detail settings down one notch to keep frame rates smooth during firefights. And the graphics still looked very good at those settings. and hit the enter key. Now you will get a continuous readout of the current and average fps in the upper right of the screen. This lets you see how the actual frame rates change with different settings. So the bottom line is, if you have an Athlon system running at 1.2GHz or above, (or a P4 1.7GHz or above) and a GeForce 3 card (200 or 500), or an ATI Radeon 8500, you'll be able to play the game without upgrading your system. I did not test MX cards yet, so I can't say for certain, but my guess is that if you have a GeForce MX card, you will want to upgrade in order to play UT2003 with acceptable detail settings. I tried playing the game with all details and graphics settings turned off, and I must say it really resulted in a very noticeable loss of eye candy. The game was still fun to play, but it lost much the draw that the new game engine provides.